On December 24, 2017, Ambassador of Georgia to the State of Qatar H.E. 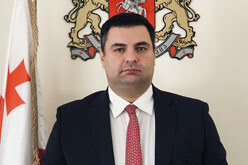 Nikoloz Revazishvili presented his Credentials to H.H. Sheikh Abdullah bin Hamad Al Thani, Deputy Emir of the State of Qatar. The Ministry of Foreign Affairs of Georgia strongly condemns the heinous terrorist attack on November 24, 2017 on the mosque in Bir al-Abed in the North Sinai province of the Arab Republic of Egypt that resulted in the death of hundreds of people. With support of the Embassy of Georgia to the State of Qatar and Vanda Art Gallery,on 17 September 2017 in Katara Cultural Village Foundation was inaugurated Expressing Space - New Art from Georgia exhibition. Visa-on-arrival arrangement for Georgian citizens! Dear fellow citizens of Georgia,Effective from the 11th of July, 2017, citizens of Georgia will be granted immediate entry visa upon arrival for a period of 1 month, against a charge of 100 Qatari riyal.